Grew Up... in Brooklyn as the son of an alcoholic and racist father. Andy learned many lessons – both positive and negative – from his blue-collar dad that stuck with him for decades. Living... in New York City. It’s still a gritty and fairly dangerous Big Apple in the early ‘90s. Andy is a born-and-bred New Yorker and has lived there his whole life aside from a tour in Vietnam as a Marine. He doesn’t like to talk about that much. Profession... police detective in the NYPD’s 15th Precinct in Manhattan. Andy is very effective at his job, as he can usually harness his simmering rage as a motivator to solve crimes and put the “perps” away. But sometimes that anger gets the best of him, especially if it’s fueled by alcohol, and Andy’s inner fire can consume him and those around him. Interests... tropical fish. You wouldn’t guess it to look at him, but the gruff Andy shows a gentle side with his fish. He believes in keeping a clean and orderly tank. Andy also believes in wearing short-sleeve, button-down shirts with a tie to work; he’s definitely not a fashion piece. Relationship Status... dating Sylvia Costas, an Assistant District Attorney. Andy’s as surprised as anyone else. For one thing, Sylvia is beautiful, while Andy is short, squat, and not especially “pretty” even if he wasn’t always grimacing. He also reflexively dislikes lawyers, even the district attorneys who are theoretically on the same “side” as the police. Yet against all odds, he and Sylvia have a good thing going. She helps soften his rough edges. Challenge... conquering, or at least controlling, his demons. Alcoholism helped cost Andy his first marriage and hurt his relationship with his son, Andy Jr. He harbors some racist and homophobic beliefs that he hasn't yet shaken or resolved. He has a temper, and that can lead him to “tune up” (i.e. pummel) suspects well beyond being strategically tough on them to aid an investigation. But with the help of Sylvia and partners like Det. John Kelly and later Bobby Simone, hopefully Andy can rein in his excesses to let his essential decency come through. Personality... tough, stubborn, short-tempered, and flawed, but ultimately decent and caring. Andy is far from perfect. But like many of us, he’s a work in progress. He does want to be the best version of himself, even though he sometimes fails spectacularly. He’s not always an easy guy to be around, but it’s worth the trouble because if Andy has your back, there’s nobody more fiercely loyal. Andy Sipowicz's popularity ranking on CharacTour is #4090 out of 5,000+ characters. See our top-ranked characters and read their profiles. 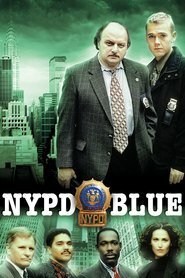 NYPD Blue is an American television police drama set in New York City, exploring the internal and external struggles of the fictional 15th precinct of Manhattan. Each episode typically intertwined several plots involving an ensemble cast. The show was created by Steven Bochco and David Milch and was inspired by Milch's relationship with Bill Clark, a former member of the New York City Police Department who eventually became one of the show's producers. The series was broadcast on the ABC network from its debut on September 21, 1993? and aired its final episode on March 1, 2005. It remains ABC's longest-running primetime one-hour drama series. In 1997, "True Confessions", written by Art Monterastelli and directed by Charles Haid was ranked #36 on TV Guide's 100 Greatest Episodes of All Time. In 2009, TV Guide ranked Hearts and Souls, Jimmy Smits' final episode written by Steven Bochco, David Milch, Bill Clark, and Nicholas Wootton and directed by Paris Barclay, #30 on TV Guide's 100 Greatest Episodes of All Time.